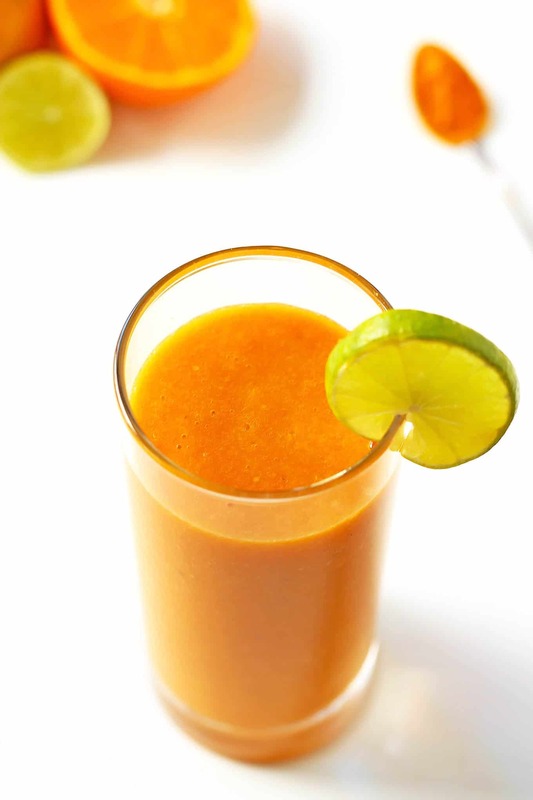 This immune boosting smoothie is made with delicious citrus fruit and carrots. 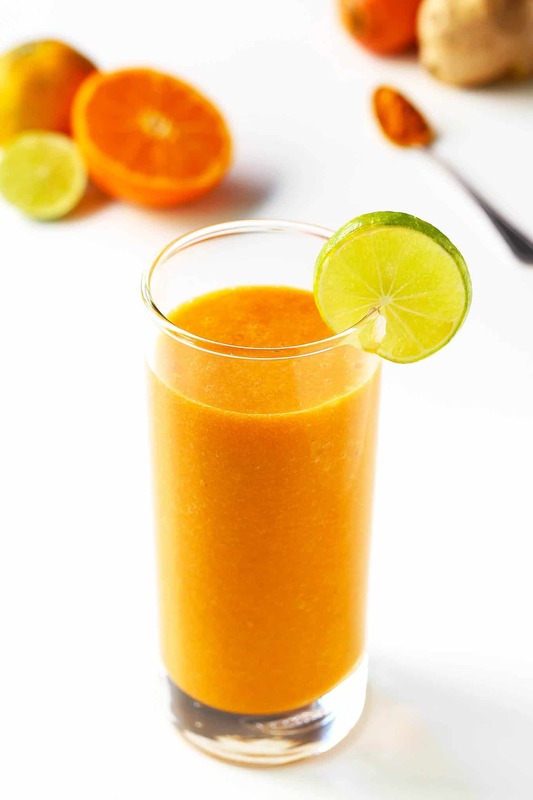 This healthy smoothie recipe is high in antioxidants, vitamin C and A with ginger and turmeric for detoxifying and anti-inflammatory health benefits. January is the time of year when searches for healthy smoothie recipes are at its highest! After indulging over the holidays, everyone is ready to start or pick up their healthy habits again as the new year begins. I am no exception. For most of the year I am trying to have a green smoothie for either breakfast or lunch, but most of December I didn’t. I already have a bunch of green smoothie recipes on Leelalicious, because I love them and I believe they are such a delicious and easy way to consume leafy greens. This time however, I was looking for a different kind of healthy smoothie. I wanted a nutrition packed immune booster! In these colder months of the year (even here in Thailand) we all could use a little boost to our immune systems. Citrus Fruit – other than being high in vitamin C, citrus fruit also contain antioxidants, fiber, and among others folate, calcium, and thiamin. Carrots – an excellent source of vitamin A and beta-carotenes, which are an antioxidant that can neutralize free radicals. Carrots also contain good levels of copper, calcium, and potassium. Ginger – known for its anti-inflammatory and antibacterial properties. In ayurvedic medicine ginger, in combination with citrus and honey (both used in this smoothie), is used to combat colds and sore throats. Turmeric – used in traditional Indian and Chinese medicine because of its anti-inflammatory and antioxidant properties. It soothes upset stomachs, and is a natural liver detoxifier. So there we have it, an immune boosting smoothie full of nutrients, vitamins and antioxidants to set the stage for a healthy and successful new year! And before you go out to buy your next blender, be sure to check out my article to learn what to look for to find the best smoothie blender for you. I also included a detailed review of my 6 favorite blenders. 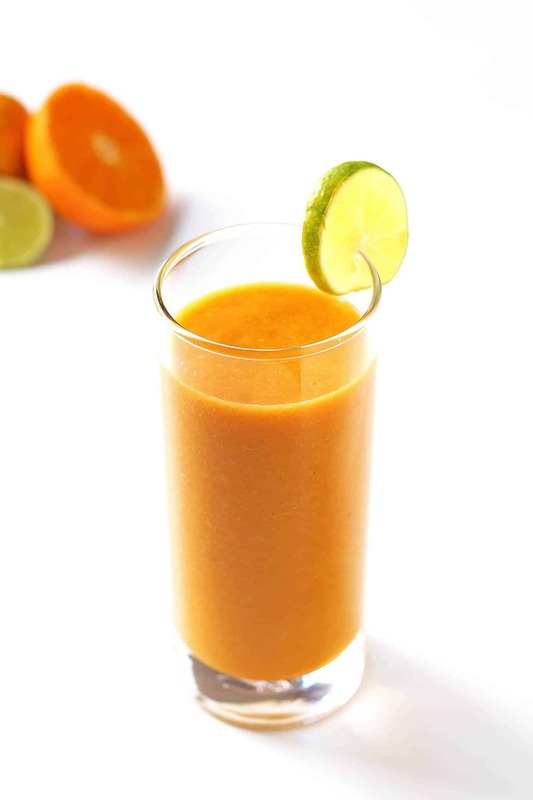 This immune boosting smoothie is made with delicious citrus fruit and carrots. This healthy smoothie recipe is high in antioxidants, vitamin C and A with ginger and turmeric for additional health benefits. 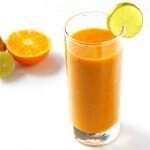 Add the citrus fruit, carrot spears, optional frozen banana, lime juice, ginger, turmeric and honey to a blender. Add water (start with 1/2 cup and add more as needed to keep the blender going) and blend until smooth. Because of the carrot, this may take a little longer than other smoothies. Taste the smoothie and adjust sweetness if desired. If you can handle it, you may also want to increase the amount of turmeric.